I bake a lot with varying degrees of success but every so often I make something and it is spectacular. A bit like when I made egg free meringues and they looked and tasted like actual meringues, something I thought my son would never eat. Or when I got a note home from school to say they were tasting traditional Scottish foods the next day and I rustled up dairy free tablet. Tonight I made gluten, dairy, egg and nut free ice cream waffle cones for the first time fully expecting a disaster and they were incredible. Like lets all stop a moment and say wow…… You can buy gluten free cones but I’m yet to find a brand free of all the top allergens and the majority of recipes I looked up contained egg. 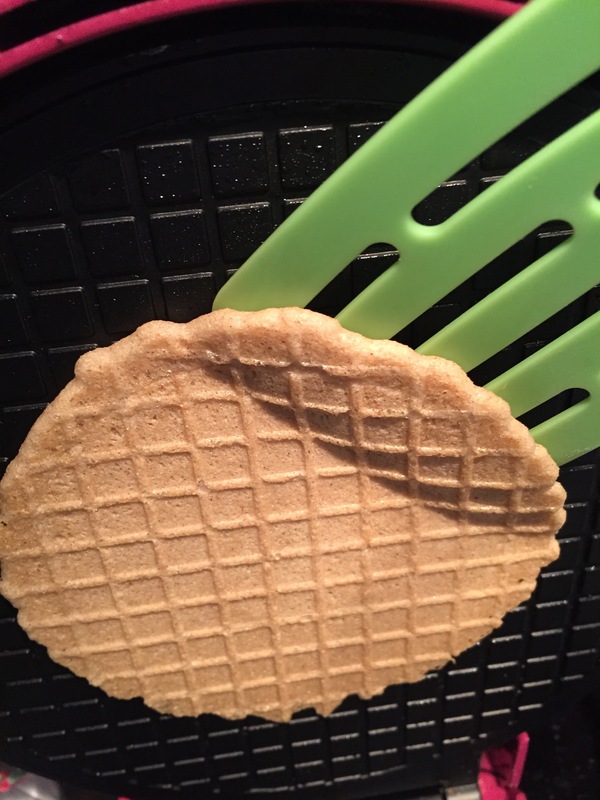 After some time googling I came across http://www.forkandbeans.com/ and a recipe for gluten free vegan waffle cones and today I bought a waffle cone maker in Aldi for £9.99! The cone maker was a special a couple of weeks ago so I was lucky (and very excited!) to find one. Measure flours, psyllium husk, baking powder and salt and sift into a large bowl. Whisk to combine. Mix dairy free milk and sugar together then stir in oil and vanilla extract. I added an extra tablespoon of flour without realising leaving it for a couple of minutes would do the trick! 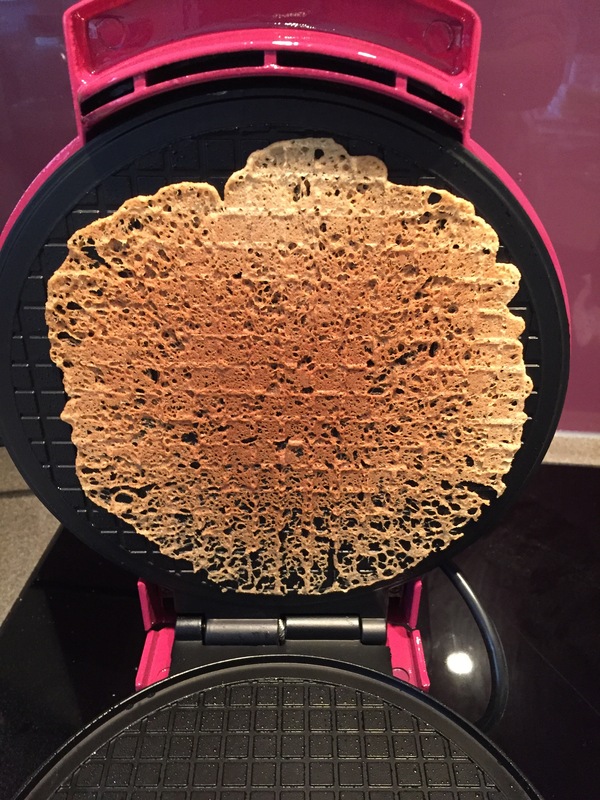 The waffle iron I used is hot when the green light is on. I greased the waffle plates with sunflower oil and wiped it with kitchen roll. Place 1 tablespoon of the mix in the centre of the cone maker and close and cook for 3 minutes. The next bit will take some practice and co ordination to master but with my husband working as my glamorous assistant I removed the waffle using a plastic slice and he rolled it around the plastic cone. The waffles stuck to the top plate and I had to work quickly to remove them before they hardened. My husband commented on how forceful I was but the waffles are quite hardy before they set. Depending on how asbestos your fingers are you can wrap and press together with your fingers or use a clean kitchen towel to hold the cone in place. It hardens really quickly!! It took us maybe 3 goes before we mastered a usable cone! The scraps tasted fab though so we persevered! We dipped the set cones in melted dairy free chocolate and would have allowed them to cool and set if we had had any patience and it hadn’t been 8pm. I dropped a mini marshmallow into the cone to block the small hole at the bottom and served it with a small spoonful of dairy free ice cream. The joy in making my boy something I can’t readily buy for him is worth all the mess and the dishes and slightly cooked fingertips. He loved his cone but was fairly matter of fact about me making them. This is his Mummy after all who made dairy free creme eggs at Easter and an Angry birds birthday cake without wheat egg or milk. It’s really (feel free to replace really with an appropriate swear word) hard being an allergy mum but tonight I am a superstar. 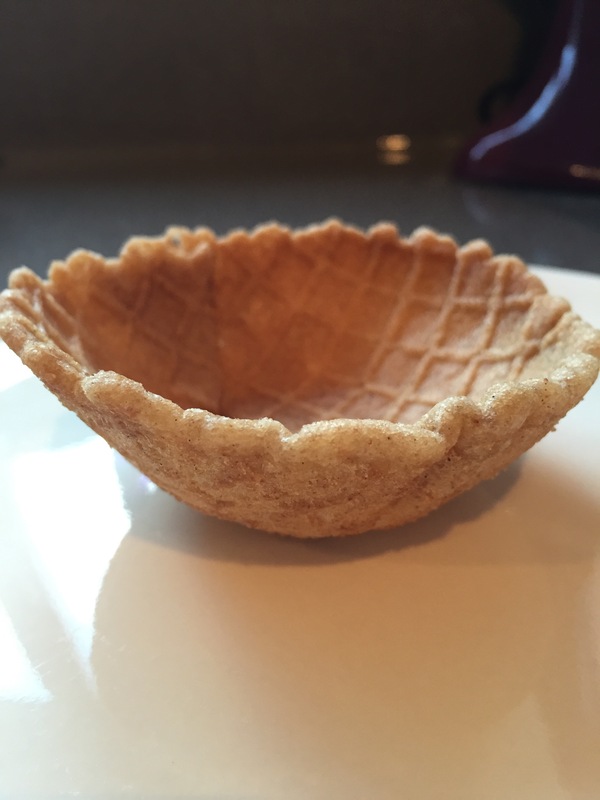 P.s you can mould the just cooked waffle into a small bowl/muffin tin to make an ice cream bowl. That looks amazing, I love the marshmallow idea. 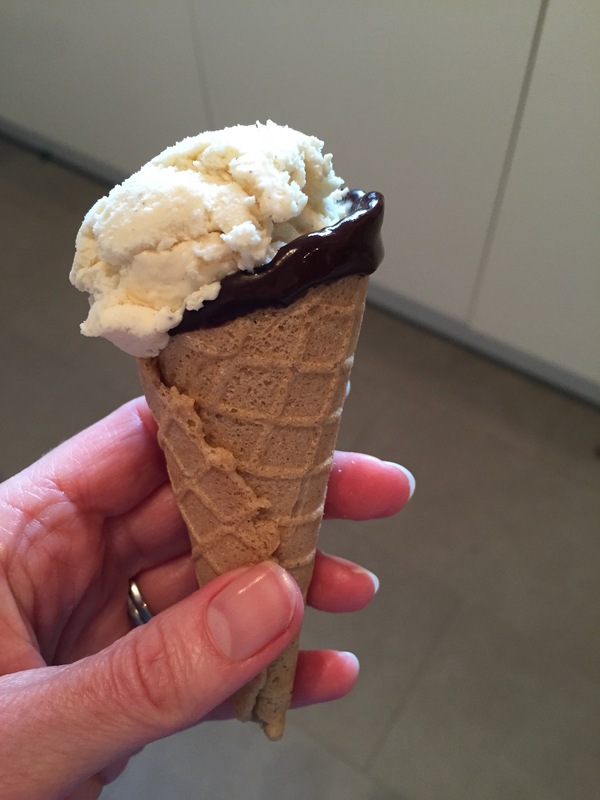 I think melted chocolate would be lovely in the end of the cone but not sure how you’d stop it escaping before it set! They were a little bit of a fiddle but so worth it! Try Aldi, they might have some left! We went for the ice cream maker that was in the same week. I will pop back in to have a look.